You’d think we just won the lottery here at Gustiamo. The NEW HARVEST EVOO has arrived! Seriously. We are so giddy, we even had our trusty UPS guy taste it (he loved it). The new harvest oil is always a cause for celebration, but this year more than ever. After last year’s difficult harvest, the Italian olive is back, with a bang. This year’s Italian EVOO is the best it’s been in years. This couldn’t be more true than for our EVOO, Il Tratturello. This EVOO is made in the heart of Molise by Francesco Travaglini. Here below is a photo from the harvest, taken just a few weeks ago. The wonderful growing season + perfect amount of rain has made Il Tratturello beautifully and notably intense. It is the perfect expression of a robust Southern Italian EVOO. What you’ll notice most about this oil is its profoundly green aroma. Then comes its marvelous freshness characterized by notes of green almonds, artichokes, and freshly cut grass; with a balanced intense spicy and bitter finish. This oil is for those who like intense EVOO. Bravo Francesco on a beautiful vintage! 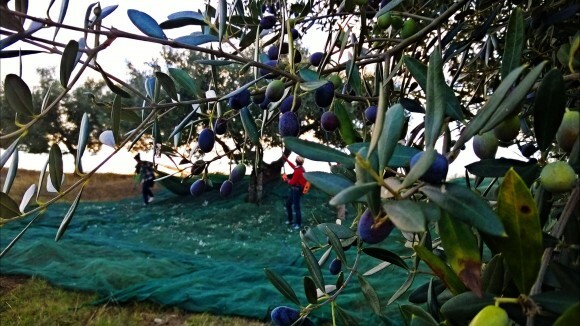 This is the Italian 2015-16 New Harvest EVOO! Are we this season’s first in the USA? Previous Post Do You Have these Ingredients?